Our Sole line of earrings feature exterior gold foil wrapped with authentic Murano Glass and Swarovski crystals. The earrings measure approximately 1 1/4 inches in length and hang from gold fill earwires. 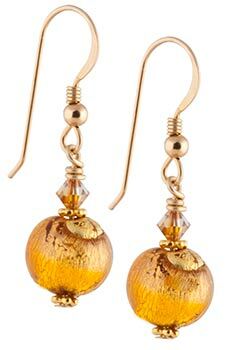 This pair of earrings features the warm glow of topaz glass over 24kt gold foil.